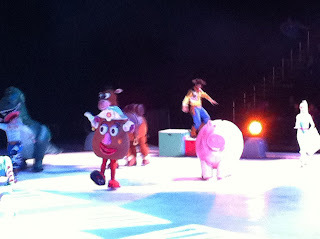 We just got home from the Phoenix opening night of Disney on Ice presents Disney/Pixar's Toy Story 3 show. According to Nate, it was "fleeping amazing!" I would have to agree, although I'm not sure what fleeping means. He tells me it's an adjective that makes it even more amazing. I wasn't sure how they would translate the Toy Story 3 movie to ice, but after watching the show, I think they did a fantastic job! There was enough of the movie plot to be familiar, but the choreography and the music made it an excellent ice show. The music chosen was upbeat and fun, and went perfectly with the scenes and the skaters. One thing that I noticed that was even better than previous shows was the use of lights. The lights helped set many of the scenes and really brought the set to life. At one point, the center of the stage looked like an old-fashioned TV set and during another point, the ice was flooded with rainbows. The skaters were fabulous. They have so much talent, and athletic skill, that it is fun to watch them skate. There were so many great numbers -- and we all chose different favorite parts when we were talking in the car on the way home. The aliens and the Barbies were definite hits! I'm also amazed at how well the skaters do in the elaborate character costumes. One thing that I love about these shows is that they are wonderful for all ages! My 4 yo daughter has a great time, but my 9 and 11 yo sons also had fun and laughed and clapped throughout the show. Bo is in Florida for work today, so my mom was able to come with us and she thought it was terrific. I know that when we attend one of these shows, that everyone will leave feeling that they had been entertained for 2 solid hours. Every show seems better than the last! 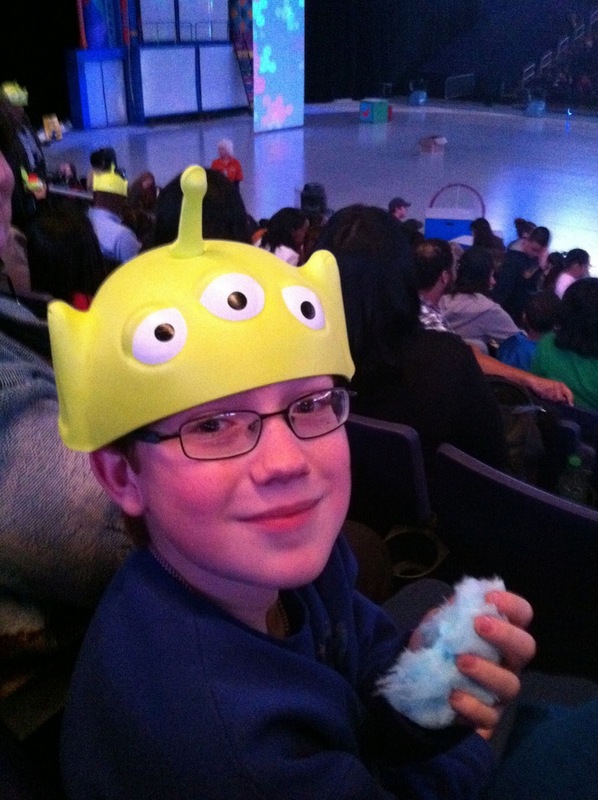 I just wanted to tell you how much we enjoyed Disney On Ice Toy Story 3 last night. The skaters were fantastic, the costume colors were brilliant, and Barbie and Ken a hoot! *** really enjoyed himself, and laughed during the alien performance. It was a perfect evening and I enjoyed sharing it night with my little man. She even shared a picture of her and her son at the show! Disney on Ice presents Disney/Pixar's Toy Story 3 is in Phoenix through this weekend. You can still use the discount code MOMMYDEAL to purchase 4 tickets for $44. (this post explains the details of the discount code) It's an amazingly fun show, and I know you will have a good time!